Over the course of the last month Chinese fears over governmental currency manipulation have caused a surge in buying. Chinese investors are indicating frustration with devaluations of the Yuan, but how long can their appetite for bitcoin sustain the huge upswings? 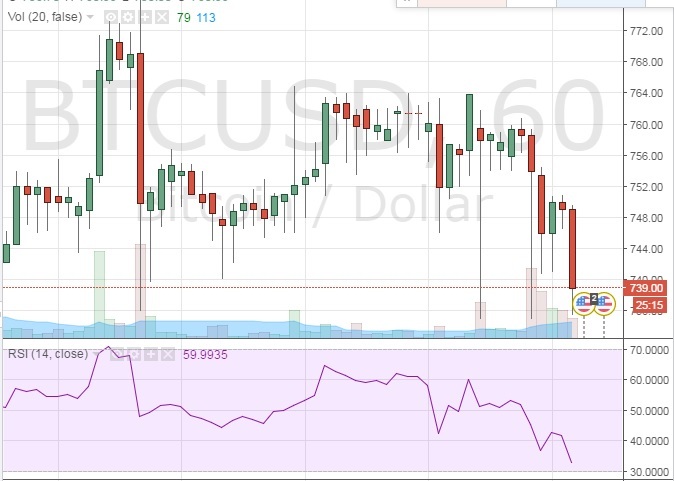 Trading over the weekend saw bitcoin once again fighting between two opposing forces. On the upside, momentum and positive financial coverage have driven the price against technical expectations. On the downside there are some clear indicators of profit taking at the $780 level. This could continue if investor buying eases and traders begin to sell off their recent earnings. RSI continues to be the best indicator for short term traders. Current resistance at the $780 level has been established after two bullish runs were cut short at that level. This Spongebob Bounce House pattern is shown on the chart below. In both cases, RSI approached or breached 70. Over the course of this run from $420 to $750, each time the RSI has risen above 70 there has been a pullback. After a short period of consolidation there has been another run. On the opposite side of the trade anytime that RSI has dipped below 45 and approached or gone below 40, there has been a noticeable uptick shortly thereafter. RSI is particularly important right now because the mass buying power driving this run is largely being fueled by one particular group in Chinese buyers. Traders can use the currently established RSI trends between 40 and 70 to make quick decisions on buy and sell levels. Mainstream sentiment for bitcoin remains very bullish. There is simply a lot of momentum with the miner reward halving, the current Brexit situation, and increasingly positive news about bitcoin blockchain technology. With each spike from $420 to $780 run coming after a short period of consolidation and so many positive factors in place, it is difficult to imagine that bitcoin will not crack the current $780 resistance level and surpass $800. The next levels of resistance after $780 are at $820 and $850, where resistance put up a faint fight the last time bitcoin surged to this level. A pullback that goes below the current levels of consolidation between $725 and $780 is unlikely.